Seedings for Section 6A were announced on Wednesday, Feb. 16, with Little Falls selected as the top seed. The Flyers' selection was almost unanimous with No. 2 Sartell-St. Stephen also earning a first seed vote. 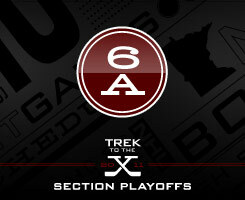 First round action of section play begins on Saturday, Feb. 19 as seeds 6-11 square off. See the bracket below for the opening matchups as well as the rounds ahead.